Erwin Oudshoorn (29) from Mijdrecht (The Netherlands) has built an iPhone app to make it more easy to be understandable for other people. He is born with a Lymphatic Malfortion which makes it difficult for him to talk. it has been a long time wish for Erwin to built his own iPhone application, but he never succeeded due to the missing knowledge and the lack of a good idea. “The programming language Objective C was really hard to learn. After a few attempts, i was going to put it down. Until a new programming language was introduced by Apple called Swift. They introduced it a few years ago”, explained Erwin. “Between the christmas and new years eve from 2015 i’ve followed a course Swift. I didn’t do anything else than watching 20 hours of video footage.”, he adds. okay, Erwin had the knowlegde, but now he needed a good idea to build an app. 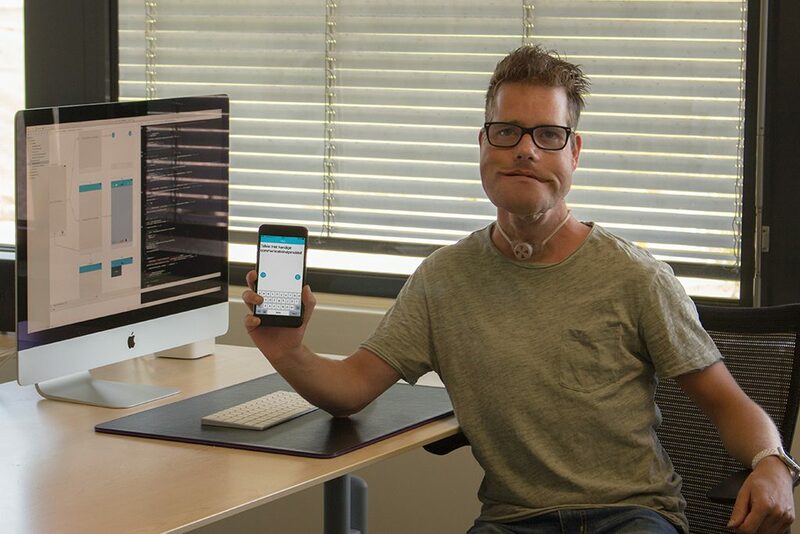 on June 16, 2016 Erwin entered a double jaw operation at the UMC of Utrecht. After the operation he could not talk for 8 weeks because the jaws were screwed on eachother . After a year Erwin has expanded the app signifitcantly. In addition to typing and pronouncing the text, there is also a draw function and a soundboard option. The draw function is useful if you need to write down or not able to type properly. The soundboard allows you to preprogram yourself the words you often need. Even if you do not have a speech shortage, the app can be very useful. For example, when you go on vacation, you can preprogram the difficult words in the soundboard to remember how you pronounce them. The iPhone app talkie is downloadable from the App store. The next challenge of Erwin is to create the same app for Android.